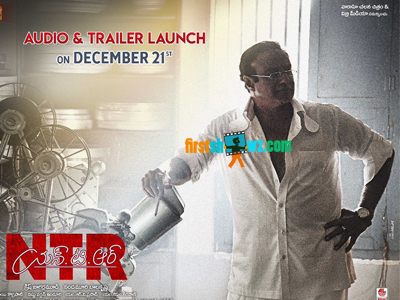 It is learnt that the audio launch of NTR Kathanayakudu will be taking place in a grand manner in NTR’s hometown Nimmakur, and meanwhile the NTR biopic theatrical trailer seems to be ready for the launch. Sources who have already seen the NTR Kathanayakudu trailer are thrilled, and say that Bala Krishna will stun the audiences in the role of NTR. The film shows the journey of NTR as the greatest actor in Telugu cinema and his rise to stardom, before the political journey. NTR Kathanayakudu slated for Pongal release is carrying mighty expectations and the makers are promoting the movie in a aggressive way. Krish is the director and the film has music by MM Keeravani. NTR Kathanayakudu stars Vidya Balan, Malavika Nair, Sumanth, Nithya Menen, Shalini Pandey, Yashu Mashetty, Hansika Motwani, Payal Rajput, Rakul Preet Singh, Kaikala Satyanarayana, Murali Sharma, Naresh, Prakash Raj, Jisshu Sengupta, Vennela Kishore in other roles.